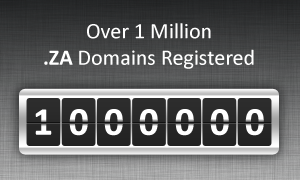 The statistics posted by the .ZA registry show that the majority of domain names, over 973 thousand, are registered under the third level domain .CO.ZA. 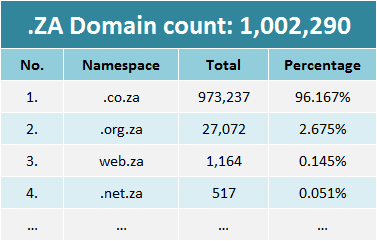 The subdomain .ORG.ZA comprises about 27 thousand domain names while the remaining names are registered under other .ZA extensions such as .WEB.ZA, .AC.ZA or .GOV.ZA. There are 54 registries of country code domains operating national Internet extensions of African countries. While making technological advances and introducing the best DNS practices, numerous African communities are facing technical, administrative and business challenges. The .ZA Registry has overcome such obstacles and is in fact the winner of the “Best Registry” Award granted by ICANN Africa to the leaders in the DNS Industry on the continent. If you are interested in registering a .ZA domain name, please use our search and register tool to check if the name you desire is available. There are no major restrictions when registering names in the South African domain. If you need assistance, please contact our Support Team at support@web-solutions.eu.